Why would you even consider creating an e-book from your blog? Mostly because it’s an easy way to collect your favorite posts, or even your entire blog, into one electronic file. If you use your blog partly as a garden journal, maybe you’d want to gather all of your Bloom Day posts, or all of your posts that relate to a specific part of your garden, into one file that you could store on your computer for easy reference. If you’re a designer, you could gather posts you’ve written about your design philosophy and projects you’ve completed and share them with your clients. And yes, you might make some money too. I can’t speak to how much is possible, but considering that there’s not a huge amount of competition yet for gardening e-books, I think it’s not unlikely that you could earn enough to buy a few extra plants each year, even if you charged only 99 cents per download. If you have a blog, you already have an audience of readers and potential buyers. Assuming that you already have the needed software (which you probably do have, or can get for free), the only main cost is the value of your time. The simple options I experimented with converted my files into e-reader formats for free. One of them also provided a free platform for selling the resulting e-book. If you create your own e-reader-ready files for sale, you can find sites that will host downloadable files and handle the sales transactions for just a few dollars a month: E-Junkie is one example. It’s actually not bad, considering. For some reason, it insisted on adding the URL for the picture file underneath each image, and I don’t think there’s a way to directly edit each page. You can do some basic things, though, like change the order of posts and add a preface. For more details, see the BookSmith FAQ page. BookSmith imports only the blog text, images, hyperlinks, and tags; other programs can import the comments as well. BlogBooker, for example, works with WordPress, Blogger, and LiveJournal blogs and includes the comments, based on an export file that you provide (they provide links to instructions for that, too). To find even more options, Google “turn blog into an ebook” (without quotes). If you already use Word for word processing and are willing to put some time into learning a few of the lesser-known features, and if you have access to basic photo-resizing software, you can produce e-books in a variety of formats for either personal use or sale. For this experiment, I tried using Smashwords to turn seven existing posts into a simple e-book that could be accessed through a variety of e-readers. It took longer to read and absorb the lengthy but very necessary style guide (which is itself a free e-book) than it did to actually prepare the interior file in Word, and another hour to create the cover file (I used Photoshop Elements). The uploaded files go through an automated process called Meatgrinder (ouch) and come out in multiple formats for a variety of e-readers, including the iPhone and iPad, Amazon Kindle, Barnes and Noble Nook, Sony Reader, and personal computers. I thought I had prepared the interior file exactly according to the directions, but when I checked out each of the reading formats, it was obvious that each one had different errors and quirks. The Kindle version looked best (I viewed it on the free Kindle for PC), and the PDF was okay too. I liked the online-reading versions the least, because they had the most obvious errors (odd photo sizes, changing fonts, and unneeded spaces). Unfortunately, there’s no way to see what the files look like until they go live on the Smashwords site. You can upload a revised file if needed, but then they go through Meatgrinder again; you can’t tweak the file specifically for each reader format. If you’re interested in seeing the end result of my experiment, you can find the Oddball Edibles e-book here. To be honest, I wasn’t thrilled with any of the results, and I’d be really uncomfortable charging for something like this, so I made it accessible for free. But the Smashwords service itself is free, and I suspect that one could get better results with a bit of practice, so I’d consider trying it again. To create the highest-quality results for sale or for showing clients, you need software that can produce PDF files. 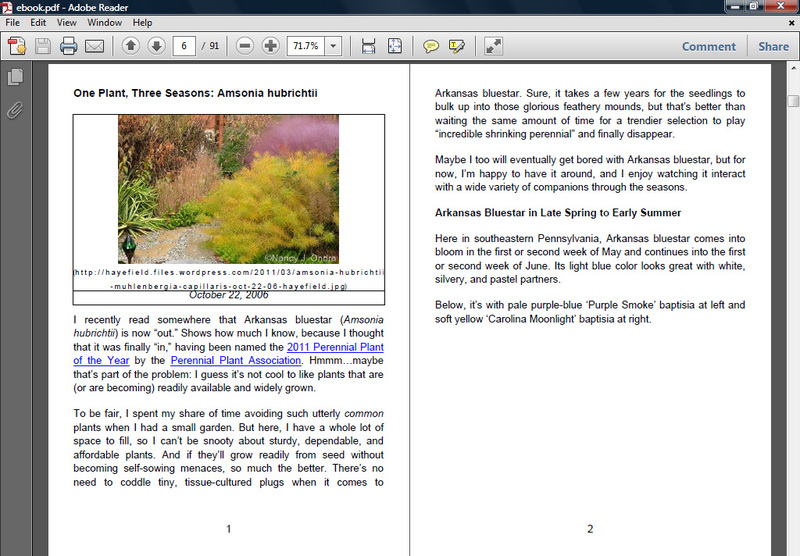 (Your readers will need the free Adobe Reader program, available here, to view them.) 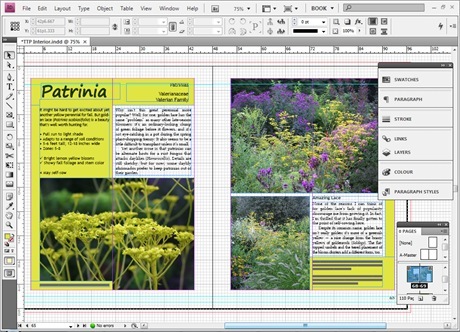 If you have experience with desktop publishing, you probably already have that capability, and you can create pages that look like on-screen versions of print books. Microsoft Word is fine for simpler, blog-like layouts, and you can save documents from there in PDF format (look in the list of formats when you do a Save-As.) Adobe also offers Adobe PDF Online for converting files online, and you can do five free conversions there. If you want to see what a high-quality, finished gardening e-book looks like, check out Michael King’s e-books at perennialmeadows.com. The web page for each title includes a link where you can view sample spreads; it’s just above the purchase information. I bought Introduction – Perennial Meadows, and though I’ve only had time to skim (or scroll) through it so far, I’m definitely glad I got it and look forward to reading it more thoroughly. Anyway, that gives you a taste of some options you have with e-publishing. Keep in mind that, in most cases, you’re not limited to using your blog content just as it is; in fact, you’ll probably find that you want to make at least minor changes (update any outdated links, add some new photos, and so on), or perhaps even add a few new entries as a bonus feature to entice buyers. If you give e-publishing a try, I’d love to hear about your results! Wow! I’m impressed with your tech-wizardry. A great little ebook. I’ll be looking for more for my iPad! Thanks, Marie! You could do it too. I don’t own any e-reader gadgets myself, and I don’t know how many people actually want to look at gardening information – especially with photos – that way. Having the capability to create e-books without expensive software or lots of training opens up a lot of possibilities for sharing information. Still, I prefer “real” books and blogs. How about a collection of all of your propagation-related posts, Dave? That kind of first-hand information is invaluable. It could be a good winter project! Thanks for all the useful information, Nan. I’m sure I’m not the only garden blogger who has dreams about turning some of my favorite/best posts into a collection of garden essays, so it’s really helpful to know about these options. It’s a lot to think about, isn’t it? But it’s so exciting to find new options for personal garden record-keeping, sharing collections of your favorite posts with friends, or even maybe making a little income from your blog. It sure is a lot less risky than investing time in finding a publisher, waiting a year of more for your book to be published, and then hoping it sells! Great Information–I never seem to spend the time exploring publishers–just fill my notebook outdoors—Now that April fools is past hopefully, i will start to ‘catch up’ in the garden. Love your blog and beautiful pictures ! Hey, Rita! There’s a whole lot of info out there on the various e-publishing options, but mostly for text-only e-books. Including images adds a whole level of complexity, and most of the sources I found said that it wasn’t even worth trying Smashwords if you have pictures. It worked out pretty well, though, considering. Can you believe it: Snow just a few days ago, and today it’s going to be 70? Welcome spring in Pennsylvania! Nancy, I spied your “Perennial Care Manual” at the Mass. Hort. book table at the Boston flower show last month and have now become an official Nancy Ondra junkie and member of your fan club LOL. I’m loving your books, your blog, and this post especially! I actually posted a review of your book on my blog, I was so impressed. Thanks for all of the fabulous information you share! The idea of creating an e-book is just one more that I found very intimidating but am very interested in exploring. Thanks for demystifying it for all of us! Hi Cathy! Gee, I always thought Mom was kidding about the fan club thing. Now it has two members! I’m so glad that you found me here, and I’m delighted that you’re enjoying the blog, and the book too. If you decide to try the e-book route and have questions, let me know. Thanks for this information! BTW, I thought the HTML version of your e-book looked good. Thanks, Rose. I don’t know why the font in that version switches between Times Roman and Arial, and the contents hyperlinks don’t work. But it wasn’t bad for a first try, I guess.